Last week, a few friends gathered for games over pizza, and they ended up playing Puerto Rico, a board game in which each (in this case) white male player uses brown “colonist” pieces to amass wealth and take over an indigenous island. I could watch one guy’s stomach turn in dismay. So many games have us mastering others (as in this great piece on New Zealand), but few make it so clear. But other serious games have us enter into messy experiences to better empathize or change things for the better. Perhaps you’ve worked with friends to save the world from a Pandemic, or survived the Oregon Trail even after you’ve eaten all your buffalo and lost a wagon axle plus your smallest child. These are a few free, online serious games I found interesting. I’d love to know if you’ve seen these, and what other games or simulations you’d recommend. These games have us experience a struggle and empathize with people in that situation… (although I could see some folks just growing more hard-hearted if they thought they could do it better!). War games often set you up as a gun-slinging young man; This War of Mine has you hiding in a war-torn city, trying to survive instead of killing others. Will you steal from a little boy to get bread for your aging aunt? Can you avoid getting shot? How much longer can this go on? Amos reports that he got distracted; others found it too weighty to play for a long while. 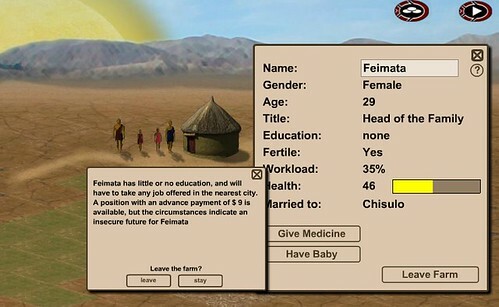 Third World Farmer is a Flash game, so you can’t use an iPhone/iPad. I’ve gone back and played this occasionally for years; it doesn’t take very long and I find it simple yet absorbing. Your goal is to feed your children, make sure they don’t get sick, and ideally send them to school. To do this, you’ll probably need to store toxic waste or grow illegal drugs. The way I succeed is to sell off my husband and children and marry someone new every few years. Why feed a worn out person when you can get a fresh new one for free? She’s had a baby and is worn out; send her away and get a new spouse. Heartless but effective. (You might also see Cost of Life if you’d like to struggle to stay alive in Haiti. Inside the Haiti Earthquake is highly rated, but I haven’t paid $5 for a year’s access). Closer to home, Payback sends a naïve young student to college without scholarships or parents who can pay for it. Do you rack up student loans, or spend every hour working and studying so that you can survive debt after college? I tried working all the time, but then my character got depressed and dropped out of college…. so… let me know how you do. And for real, see this student debt calculator and avoid taking out more loans than you can easily pay with a low-wage job and kids! Spent reminded me of Barbara Ehrenreich’s experiment trying to survive the American working class in Nickel and Dimed. Can you get a job, hold it, and pay enough rent to get to the next paycheck? I can survive a month as long as I never buy insurance, skip family funerals, and never let my children go have fun that costs money. The Uber Game similarly has you supporting kids and paying for housing in the Bay Area. If you work long days, be nice to people who trash your car, and park illegally, you may get through the week. The Redistricting Game is an older Flash game that’s a great concept but needs a more modern visual design. It’s still worth playing a round or two of gerrymandering: just divide up voters by where they live, trying to ensure your side of democracy is always and forever in power. Fake It to Make It lets you make money online. The catch? You’ll only make ad revenues if you plant fake news on social media. This drives page views and increases your income… and possibly causes the demise of democracy. It’s a useful object lesson in how to get rich with fake news, and the only thing that keeps me from doing it is that it’s actually a lot of work. 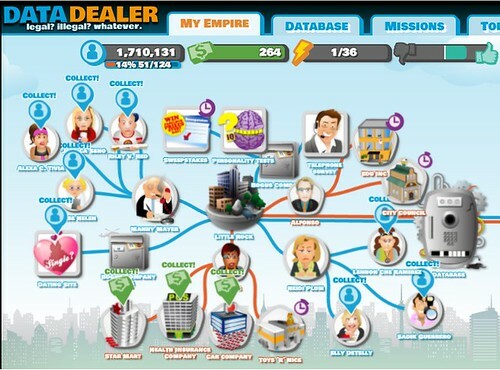 Finally, Data Dealer is an educational game that lets you collect people’s personal data in exchange for dates, personality tests or sweepstakes… and then sell it for a profit. (If you do nothing else, read Zeynep Tufekci and Bruce Schneier on why this is so important). Have you tried these? What online games have you enjoyed?